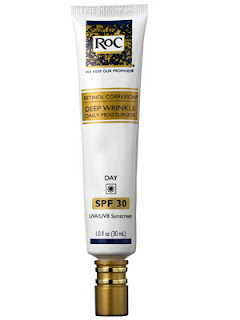 This contains one of the best anti-aging ingredients available to date in a nonprescription product: retinol. It also has broad-spectrum UVA/UVB sunscreens and is noncomedogenic and oil-free. It comes in an airtight aluminum tube to keep the retinol from breaking down; it is a medium-weight cream that doesn't feel greasy; there is a slight medicinal odor. Dermatologists rave about retinol, and this offers a potent dose to help make lines look smoother over time. The addition of glycerin helps counteract the dryness retinol can bring on, and broad-spectrum UV filters prevent future damage.